PHOENIX — Calling the governor’s proposal inadequate, leaders of the #RedForEd movement have scheduled a vote this week to decide by Friday whether to strike. But Noah Karvelis, one of the leadership team members of Arizona Educators United, said there’s something even more basic. The governor’s office has estimated the ultimate price tag at more than $670 million, above and beyond the regular state aid to education. “Sustainability is absolutely critical,” agreed Tim Ogle. But the executive director of the Arizona School Boards Association isn’t sure it will take a strike to guarantee the dollars will be there. “Our job is to hold decision makers accountable,” he said. And Ogle said there are legislators who apparently are willing to put the governor’s funding promises into law. “It’s silly to say ‘no’ to that,” he said. Scarpinato said the state will have more than $1 billion to both fund the raises and restore the dollars cut from school capital needs. Aside from a healthier economy producing more tax dollars, Scarpinato said fewer people will need state services like health care. “Don’t believe anything besides what they put in the budget,” he said. Thomas said even if the additional 9 percent is funded this year. Even if funds for teacher pay are identified, Ducey’s plan does not include others, like school counselors, custodians and lunchroom workers. And then there’s the issue of adequate funding for classrooms. 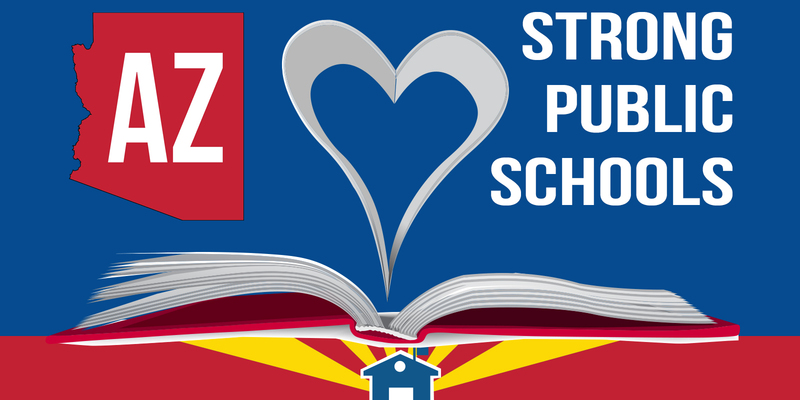 “My students deserve upgraded, modern, 21st century technology,” said Catherine Barrett, a reading specialist in the Phoenix Union High School District. “My students deserve to have repairs on their buildings and working plumbing and holes in walls patched,” said Derek Harris who teaches band in the Tucson Unified School District. “I can’t walk back into my classroom without getting more for our students and this movement,” he said. Harris said paper ballots will be distributed today (eds: Tuesday), with a “vote-in” on Wednesday and results announced Friday. He acknowledged that Arizona Educators United can’t force teachers to walk out. “But peer pressure can be very important,” Harris said. He said that’s why any decision will need something more than a simple majority, though organizers have no firm threshold. And Harris said they also want support for a walkout from education groups across the state and not just from the state’s metropolitan areas. Ogle said it isn’t the job of his association to tell the employees what they should do. “Without their collective efforts, we wouldn’t be having these discussions,” he said. There’s also the question of how much more money a strike might produce — if any. – Originally written by Howard Fischer. Published by White Mountain Independent on 04/16/2018.